This is print first feature published in STIR magazine. Increasing concentration of land ownership and financial speculation in the UK is making it more and more difficult to use the land for alternative purposes, such as land co-operatives and community-supported agriculture. In this interview George Monbiot talks about how every successive round of enclosure has not only removed us from the land but also left us feeling like we have no stake in it. His latest book, Feral, is an attempt to re-energise our relationship with nature by not only rewilding the land but rewilding ourselves. Jonathan Gordon-Farleigh: You have written extensively about land inequality and have claimed that 0.6% of the population owns 69% of the land in the UK. How bad has it become? George Monbiot: In the past ten years or so landholding has concentrated by a further 10-12% and this is a remarkably rapid rate of consolidation, perhaps as rapid as anything we’ve seen in Britain since the Highland Clearances. What’s happening is small farmers are selling and being bought up by absentee landowners, and city institutions are using bonuses to invest in land. The City does not believe in itself because if it did it would be investing in stock, shares and bonds, but instead it’s investing in land and houses. This really limits the scope for alternative land use. The vicious combination of rising land prices, as a result of the speculative interest in the land and the artificially boosted prices caused by farm subsidies, really stops community projects and new entrants who want to do something more interesting with the land, such as rewilding, even more difficult. It makes being proactive on the land ten times harder. JGF: In the same way in which the housing crisis has refocused the public’s attention on vacant homes, second homes and under-occupied homes, what will it take for the inequality in land distribution to become a public issue? GM: It’s a good question because we are almost uniquely removed from issues of land ownership in this country because we’ve been excluded from it for so long, but also because the dominant system of land ownership is so long established, really dating back to the Norman Conquest. It is accepted as the way things are because we have a very powerful culture of deference, which is constantly reinforced. So, for instance, a few months ago Fraser Nelson — the editor of the The Spectator who is very tuned in to Tory thinking — wrote an article where he argued that anyone who cared about wildlife was a Londoner, and that true country people didn’t care about wildlife and the environment. Yet, David Cameron is a true country person, even though he’s lived in the city all of his adult life, and only goes to his Witney home at the weekend to go shooting, and so he’s a true country person. What he’s really talking about is class: this to say that the only authentic country people are the landowning class, many of whom don’t even live there but only return to their estates on the weekend. Only the landowning class has a legitimate voice in the countryside — everyone else is illegitimate. One of the ways this message is constantly reinforced is through something I call agricultural hegemony, taken from what Antonio Gramsci calls cultural hegemony. Agricultural hegemony is when the demands and perspective of the farmers and landowners is being conflated with the demands and desire of the whole rural population. I’ve been very struck by this in recent times where I’ve come across people who are supposed to be working on behalf of the entire rural population, but are only interested in what the farmers want. They conflate the farmers with the rural population as if they’re one and the same. This is not just happening here in England — you see this happening at the level of other national governments in the UK as well. When I went to interview Elin Jones, who is minister for Rural Affairs in Wales, it was very frustrating because she was wholly incapable of answering any of the big questions I put to her. When she sat down she set out her notes in front of her, and beside it put down the National Farmers Union diary. Every time she opened her mouth it was the National Farmers Union talking. The problem is she does not just represent the interests of the farmers, she is minister for rural affairs and should represent the whole rural people of Wales. Now, in Wales, which is considered to be a very agricultural nation, only 5% of rural people are farmers (including part-time farmers), meaning that 95% of rural people are basically marginalised in political decision making. This is also similar in England but not quite so much in Scotland. What you’ve got here is a real democratic deficit — a real lack of democracy — because the majority of rural people do not really have a voice in what happens in the countryside. Meanwhile, farmers have a disproportionately powerful voice: They command all the money through farm subsidies; they have all these exceptions when purchasing or applying for planning permission; they are able to treat the land without any reference to the people who live around it, often causing devastating environmental damage. Yet, somehow we have come to accept all of this, and pay for all of it. I’ve been surprised when writing about farm subsidies because I would have thought that, in an age when basic public services are being cut with devastating consequences for the poorest people, this would be a really explosive issue: that we’re paying millions every year to keep the Duke of Westminster in racehorses and to keep all the other large landowners in business. Basically, farm subsidies, because they are paid on the basis of how much land you own, are exactly the same as in the feudal tax that used to be paid by the vassals to their lord for the benefit of him owning all the land. It’s exactly the same today, there’s no difference at all, yet in this age of austerity we pay it without complaint. What I’ve been struck by is that when I’ve have written about this issue there is very little public outcry against this like there is with other issues such as corporations not paying their tax where people get really inflamed and angry. But we are so removed from thinking about land, agriculture and the rural economy, have been confined to the cities for so long, have such a powerful cultural deference in this country that we are not aware of this grotesque injustice which is carried out against us. JGF: After the successful campaign to stop the government from selling off England’s forests in 2011, campaigners pointed to the need for a piece of legislation that would stop future governments from resubmitting the same proposal for privatisation. How important do you think it is to create new legal ordinances and community charters to protect our shared commons? GM: There’s an analogy here to the village green and commons, that once they’re registered they remain this way. I believe this needs to be widely extended and certainly the national forest would be a very good candidate for this. Well, the ‘public forest estate’ would be more accurate. However, it’s all going in the opposite direction with the move towards marketising them and this has to be seen as a new wave of enclosure. What is effectively being said is that biodiversity, the hydrological cycle, typography and all these other public benefits — such as the rain — no longer belong to everyone and no-one but now they belong to the landowner. It is now proposed that the landowner would be paid for supplying it. Now, I would be slightly more sympathetic to the landowners if they were fined for failing to supply them. For instance, if every time your house flooded because of poor management of the uplands (which is one of the biggest reasons for increasing floods, even more so than climate change) the farmers would have to pay for the damage, then you would be looking at a market. However, it’s currently a private financial initiative because the landowner takes the profit and the state keeps the liabilities. There is no downside for them, and even if it was a market there would be many problems. JGF: They socialize the costs, and privatize the profits? GM: That’s exactly what they’ve done and it’s going even further because they’re securitising it and getting the City to incorporate it into secondary markets. It’s insane but it’s become the prevailing trend the government is currently supporting with their Ecosystem Markets Task Force and the Natural Capital Committee. They are all rigorously supporting these schemes. These have to be seen as new acts of enclosure: They are taking it from the public, from the common domain, by deeming all of these natural assets, even including the rain, to belong to the landowners. Who’s doing this? Well, the landowning class. You just have to look who’s in Defra. Richard Benyon, who is minister for the environment, food and rural affairs is the biggest conflict of interest since Ernest Marples, a motorway builder, became the transport minister and, as soon as he took office, closed the railways. The minister for the environment, Richard Benyon, is also a huge land estate owner. He first attempted to do a buzzard cull because two of his gamekeepers complained about them killing some of his pheasants. He is now selling quarrying rights on his land that will completely trash the local wildlife trust’s ambitions. He has ruled out precarious liability for landowners if their gamekeepers poison birds of prey. He owns a huge estate in the south of England and a grouse estate in Scotland. He has also ruled out a right to kayak and canoe on rivers and owns official rights on the Kennet and Pang. Here’s the interesting thing though, and it comes back to my point about farm subsidies. This is an issue that I’m kicking up about it in the Guardian and I’m not sure many people are interested in it. If, for example, this was part of the urban economy and we found out that Michael Gove had owned a private education company and that his policies were directly benefitting his shares in that company there would be a massive outcry. He quite simply wouldn’t be able to remain in office. However, because this is to do with the rural economy, because it’s about land and agriculture from which we’ve been successfully excluded from by previous waves of enclosure, we believe it’s got nothing to do with us. This is the real impact of enclosure, or the lasting impact to be more precise: Our minds have been enclosed. There are all sorts of places we don’t go, even in our own minds — there are trespassing signs all over our minds. We’re not going to go past that point because it’s someone else’s business. We’ve been shut out of the intellectual commons by being shut out of the physical commons. JGF: How we manage resources has been the main ideological battle for decades and you’ve argued that we are only ever given a false choice over such ownership: state or private. With an upsurge in community land buy-outs, ecological land co-operatives and publicly owned forests, how viable are these ownership models as alternatives? GM: Well, they’ve certainly worked in the past for the great majority of human history, and if land was considered owned at all, a concept I’m uncomfortable with, most of it was considered to be owned in common. You might have rights in that land, or certain assets within that land, but the idea that you personally own the land has in most cultures and for most of history, not only been an anathema but unthinkable. It was so far outside the cultural concepts and ways of thinking that it would never have occurred to people. That’s like trying to imagine someone owning all the air and charging us for breathing it. It was so far out of people’s framework it just seemed ridiculous, but it’s become normalized because of the successive rounds of enclosure. JGF: What examples could you give of working alternatives? GM: My own involvement has been in Tinker’s Bubble as a shareholder, from almost the beginning. I will always be inspired by it but haven’t had much to do with it recently. I used to go down there a lot and it was important for me to see the extent of which your attitude changes towards the land when it’s not someone else’s land or if it’s exclusively owned. I could feel much more sense of involvement and engagement with the land than when I was on someone else’s estate. I’ve got a few friends living around the UK in estate cottages, those who want to live in remote places, and they’re almost treated like serfs in a feudal system. There is so much deference and fear, what’s been called the Norman yoke, and it remains extremely powerful in this country. So being in a place like Tinker’s Bubble really changes your attitude to the land. You realise the potential you can unlock when engaging with that land and the way in which that can transform and enhance human culture and delight in life. JGF: One of the contentions in climate activism is the role we should expect the state to play in confronting climate change. After the bonfire of promises at consecutive climate summits, and regulatory capture showing how big business shapes the global political agenda, it is understandable how environmental activists expect little or nothing from the state. What’s your position on this? GM: At the moment there is no plausible way of dealing with climate change. There are no plausible actions in train at the moment that could prevent climate breakdown and they’re not coming from states, political movements or corporations on a sufficient scale to prevent 2, 3, 4, 6 degrees of warming. Every hope that we entertain is a utopian hope unless we can somehow raise the scale of activism, by transforming campaigns such as 350.org into such a big movement that it’s impossible for anyone to resist it. The particular political structure we have is less relevant than the strength of public mobilisation. They have done some fantastic work, and people at 350.org and Campaign Against Climate change and many others — Friends of the Earth and Greenpeace — are doing great work, but it’s not enough. We are very weak at the moment. Now, my argument would be if we could mobilise on a sufficient scale we would still need something through which to exercise our agency, as a problem like climate change can only be addressed through an international agreement. Your domestic biodiversity and the cleanliness of your rivers is not something you can deal with alone. You have to have the majority of the world’s nations playing and an international forum through which those nations make agreements. This suggests it would be much easier with representative organisations. Public mobilisation is part of the answer — the most important part of the answer — but you have got to have something that then turns the public mobilisation into binding instruments that prevent the psychopaths among us from ignoring the will of the majority and continuing to burn fossil fuels and do all the other things that are driving climate change. I also think an antagonistic engagement is entirely legitimate and we desperately need an antagonistic engagement with corporations. While recognising it will be largely symbolic, as fossil fuel companies are not going to give up their profits because of our protests alone. They will only give it up if they’re forced to give it up. The purpose of mobilising outside their headquarters and the purpose of campaigning is to tell a story to the public about how these people are destroying lives and livelihoods and destroying the natural world. And then we start to mobilise the public to demand legislation to prevent them from doing so. Only on the marginal issues are you going to get the corporations to directly change as a response of campaigns. Lastly, the argument I got into at Climate Camp in 2008 was with people who were saying that they were going to produce their own energy by building windmills. This is all fine but that doesn’t stop fossil fuels being extracted by other people. Climate change is not about what you do, it’s about what you don’t do. JGF: If we are going to be able to seriously confront the existential emergency of climate change and natural exploitation do you think we will need to, as Slavoj Žižek argues, really change our philosophical understanding of plants and nature — as well as joining movements and green parties — to challenge the current myth that to protect nature we must commodify it? GM: I’m glad you asked me that because I believe that very strongly and much of the thrust of my new book, Feral, is about re-energising our relationship with nature. I try and do that by showing the natural world is far more fascinating, unpredictable and unusual than we thought it was. Recent discoveries in ecology, some of the most significant in the last half century, include the discoveries of trophic cascades. Another part of what I’m trying to do with the book is to begin a process where we reinvest our lives with wonder and delight. One of the things I discovered when writing the book, and it is something that is completely common place in African society but ecologists can’t often see it, is that ecosystems are proactive. As in East Africa, the trees in the UK are resilient because during the last interglacial they were attacked by elephants and any trees not designed to resist it would disappear. As soon as you realise about hedges and coppicing and pollarding, and that understory trees like Holly and Yew are stronger and tougher than the canopy trees (even though they carry less weight), and that certain trees can survive the loss of so much of their bark — all elephant adaptations — it fills the world with wonder. It changes what we thought of as familiar, ordinary and slightly boring into something that is actually absolutely fascinating. So I want to light the spark of a new love affair with nature by, first of all, bringing to the front of people’s mind how fascinating Europe and Britain are, and by secondly, showing that we can bring so much back — a vast restoration of ecosystems — and that environmental destruction does not have to proceed all in one direction, but instead it can be reversed. What we are desperately lacking in the environmental movement is hope, and what I try to show in Feral is that actually there is a great deal of hope: The silent spring can be followed by a raucous summer. One estimate suggests that by 2020, and without any change in the farm subsidy regime, there will be 30 million hectares abandoned by farmers — this is an area the size of Poland. This will give the opportunity for an enormous restoration project to bring back a lot of diminishing species, and to also pull down the fences and block up the ditches as Rousseau suggested — and then we can stand back and let nature rip. One of my dreams is not just to rewild the land but to also rewild human beings; it’s to put us back in touch with nature. This is not possible, though, while we are so comprehensively excluded both physically and psychologically from the land: by rewilding large tracts of land so that every one has a Serengeti on their doorstep, making it much more interesting and exciting to visit, with the reintroduction of so many of the animals that have gone missing, such as wolves, bison, beavers, boar, grey whales, Dalmatian pelicans. 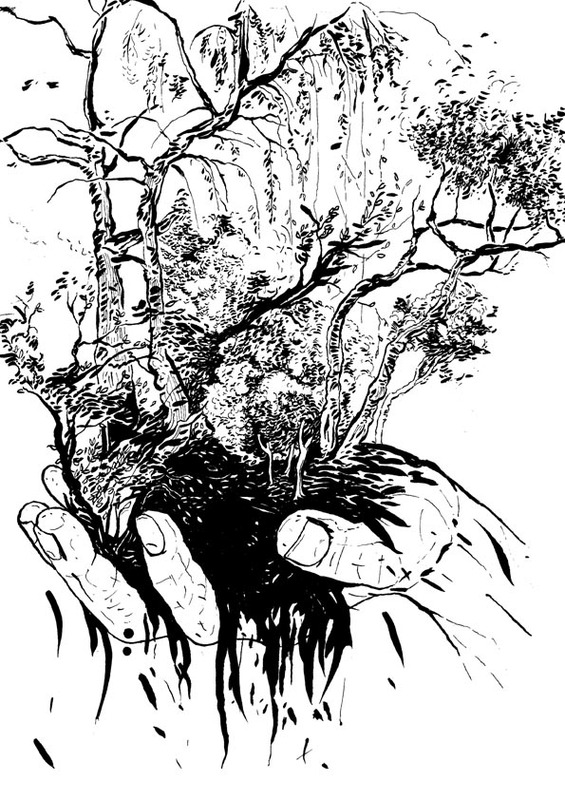 By allowing the land to reforest I think it would be far more engaging and exciting, but more importantly it will no longer look like the property of one or a few people because when ecological processes are allowed to resume, processes which are not controlled by human beings, it sends out the message that the land belongs to everyone and no-one. I believe that rewinding not only has the potential for ecological restoration but also the restoration of our sense of engaging and belonging to the land. George Monbiot is an environmental activist and author of the bestselling books The Age of Consent: A Manifesto for a New World Order and Captive State: The Corporate Takeover of Britain, as well as the investigative travel books Poisoned Arrows, Amazon Watershed and No Man’s Land. His latest book is Feral: Searching for Enchantment on the -Frontiers of Rewilding is published by Allen Lane. You have got to have something that then turns the public mobilisation into binding instruments that prevent the psychopaths among us from ignoring the will of the majority and continuing to burn fossil fuels and do all the other things that are driving climate change.